Watching people play Minecraft makes me feel particularly old. I’m someone who grew up on both Lego and video games, so the idea of a game that somewhat brings the two together shouldn’t be alien to me. Yet somehow it’s just never appealed. 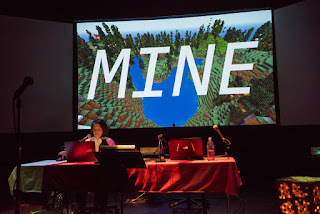 Yet if ever there was evidence of the creative power of Minecraft it’s Mine, a new theatre production from Vancouver-based company Theatre Replacement at the Arts Depot. 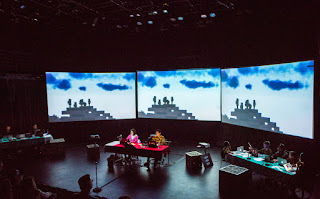 Created, directed and performed by company Artistic Director Maiko Yamamoto (alongside a whole group of other player/performers), it’s a play about the relationship between mothers and sons that is performed live within Minecraft itself. The results are fascinating. For the uninitiated, Minecraft is a 2011 sandbox video game originally developed by Swedish developer Markus Persson. As blocky characters, players can build, destroy and explore worlds created with low-fi textured building blocks, both alone or online in huge multiplayer environments. Since its release, it has become the second highest grossing video game of all time behind only Tetris, with many weird and whacky creations shared across the Internet. The possibilities are near endless. Mine was inspired by Yamamoto’s own relationship with her 11-year-old son. The two began playing Minecraft together two years ago and the dynamics of their in-game relationship were the impetus behind the play. The narrative recreates famous stories of mothers and sons, from Bambi to Beowulf, The Terminator and more. Through these stories, Yamamoto touches on a variety of themes: a mother’s fear of losing her child, a child’s coming of age, mortality, and online safety. The choice of stories is often surprisingly dark, but there’s humour in the delivery from Yamamoto and the young cast, especially as fun personal touches bleed into each story to emphasise the sense of creativity. Mostly, though, Mine blurs the boundaries between theatre and gaming. Esports are gradually becoming more globally recognised, so why can’t gaming be considered performative? The cast perform the stories within the game, projected onto huge screens behind them, while other gamers act as directors to move the camera and frame the action. Monologues are spoken over the visuals, and chiptune music (mostly from other games) plays in the background. 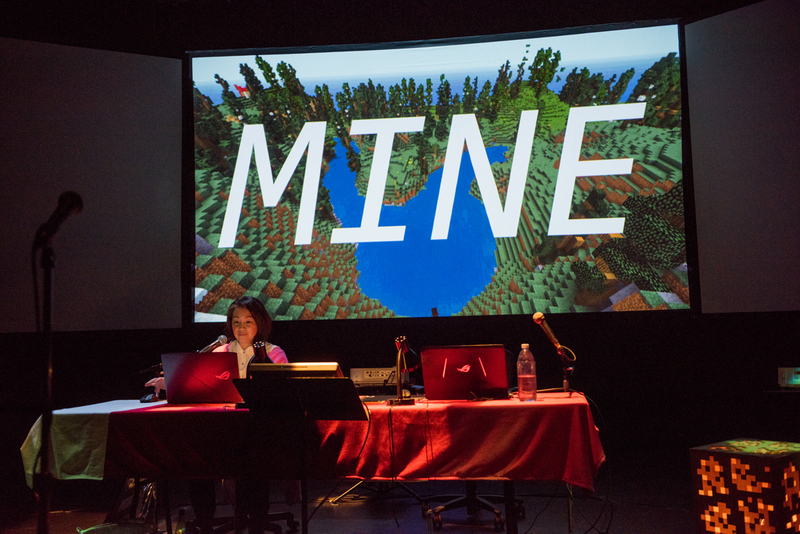 There’s a real sense of collaboration to it all, with multiple players coming together to create a single whole – the essence of both theatre and Minecraft. Theatre can be playful; here that’s made literal. Further, the narrative of mother and son highlights a generational gap and a swapping of roles. Often it’s the children who are better suited to new technology, parents lagging behind. And that spreads into the audience too. It’s a delight to see so many children in the theatre, excited to see their favourite game projected on-stage and explaining the mechanics and rules of the game to their parents – parents who remain confused and dumbfounded. Though it explores some interesting themes, the disparate stories of Mine don’t quite come together into a cohesive thread. And for some, the total use of video games might be a step too far into a strange, frightening technological world. Yet viewing theatre through screens and avatars could become a reality for the medium. For now, it remains a unique and innovative experiment. Watch: Mine runs at the Arts Depot until 23rd March, before heading to Cambridge Junction.